For Drying And Cooling Wire, Cable, And Other Extruded And Drawn Surfaces While Reducing Compressed Air. The Nex Flow™ Ring Blade™ Compressed Air Operated Air Wipe is used extensively for blowing off liquids and dirt from extruded surfaces. Priced among the lowest of any competitive units, the Nex Flow™ Ring Blade ™ air wipe is now available in 316L c/w 316L stainless steel shims, screws, fitting and connection hose. Nex Flow™ Ring Blade ™ air wipes are complete with materials you “pay extra” for from many over-priced competitors. The Nex Flow™ Ring Blade™ Air Wipe provides a uniform 360 degree stream of “amplified” airflow for blow off, drying, cleaning and cooling of almost any extruded shape, hose, pipe, cable, wire, automotive EPDM trim, rod and other materials. The unique split design makes it easy to clamp over and around the surface and to insert the material in between the two jointed halves , eliminating any need for threading. Amplified air occurs by entraining air along with the small amount of compressed used converting pressure to “high flow” and velocity for a strong blow-off force while minimizing compressed air use. 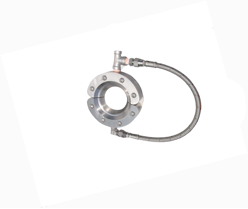 The 316L stainless steel version is ideal for very high temperature and corrosive environments.. Available in ½”, 1”, 2”, 3”, and 4” diameters for 316L stainless steel. (and in ½”, 1”, 2”, 3”, 4” and 6” diameters in anodized aluminum). Applications include: Blow off contamination and dust from surfaces, Cooling of hot extruded materials. Wipe wet surfaces uniformly, Drying of tubing, rods and extruded profiles of all shapes, Remove excess moisture from automotive EPDM profiles, Dry wire, hose, tubing and wire optic extrusions, Minimize loss of solution due to drag-out, Cleaning of paint gun tips, Drying of screen print and ink jet printed surfaces, Cleaning of ribbon and strips of material, Drying after washing, cleaning, coating, coating or plating of shapes, Window profiles and other extrusions.